Brother Danny Done, Past Master of Queen Anne Lodge No. 242 in Seattle, Washington, contacted a Brother in Brussels, Belgium, asking if any Masons or their families in Belgium had been hurt in Tuesday's terrorist attacks, and if Washington's brethren could help in any way. Both Facebook pages for Chevalier Ramsay Lodge Number 4 (the closest Lodge to the subway bombing), and the Regular Grand Lodge of Belgium are managed by V.W.Bro. Michel Huyghebaert, who was kind enough to write the following update for us. -Danny Done, PM Queen Anne Lodge 242. Here is some information about Lodge Chevalier Ramsay N.4. 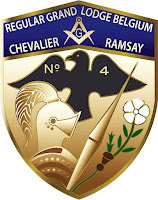 Lodge Chevalier Ramsay N.4, was originally a military Lodge, consecrated by U.S. servicemen, under the Grande Loge Nationale Française in 1964 – when NATO was still located in Paris. In 1967, President De Gaulle invited all foreign forces to leave French territory, NATO moved to Brussels, and so did the Lodge in 1970. Today, our Lodge consists mostly of ex-pats working for various European institutions, NATO, lobbies, and businessmen. Our members are now from about 25 different nationalities. On our Altar rests the Holy Bible, the Torah and the Koran. On occasion, we’ve used other Sacred Books to obligate our members. The Lodge is located on Rue Royale in Brussels, which is a very long avenue that crosses the center of Brussels, from East to West. On it, you can find Our King’s Royal palace, numerous governmental institutions, several churches, a synagogue, the Justice Department, the Museum of Fine Arts and the home of the Regular Grand Lodge of Belgium, where our Lodge meets. One of yesterday’s terrorist attacks took place at our national airport, called Zaventem. It is, in fact, the main airport in Brussels – and the biggest one in Belgium. The airport is located about 20 minutes away from the Lodge, and most of our members take it at least once a year, several times a month for some of us. The terrorists blew themselves up where everyone comes into the building. I understand one or more Brethren took a plane just before the attacks. The second terrorist attack took place in a subway station that is right in the heart of the main European institutions. It is also at a crucial intersection between the only two metro lines. That single explosion caused as many casualties as the two bombs in the airport, as the terrorist blew himself up inside a subway car. That subway stop is only 5 minutes away by car to the Lodge building. Last week, a terrorist hideout was discovered by the police, which is only 13 min away from the Lodge by walk. Friday, they arrested one of the terrorists responsible for the Paris attacks, here too, only 10 minutes away. Bomb constructing materials, and several weapons have been found there. So far, there has been no report of Brethren or their families being victim of these cowardly acts. In that regard, we are very thankful, and our prayers are with the victims and their families. I’ve also not heard of any reports from the Grand Lodge, the Regular Grand Lodge of Belgium. Terrorism on this scale is a new thing for us, and we’ve never had to deal with this. While we have not been affected directly, we will be looking into setting up a fund for the victims of the terrorist attacks, and will contact you soon with the details. Good news so far brother. Let's hope that it remains so. Glad to hear that our Brethren in Belgium were lucky to be out of the way of these terrible attacks. I was also pleased to read the signature on the letter from Lodge Chevalier Ramsay. I remember VWB Huyghebaert from the CompuServe Masonry Forum, of years past. If you're reading this, Bro Michel, a fraternal Hello. Allow me to point out that there are other masonic obediences in Belgium : Grand Orient de Belgique (the oldest), Droit Humain, Grande Loge de Belgique. They represents 90% of the freemasons in this country.